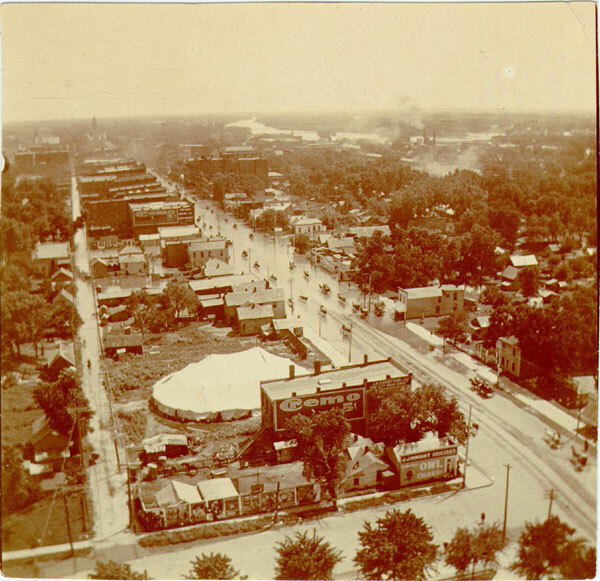 Keywords: Wichita, transportation, street scenes, residences, mule cars, street railway, streetcars. Description: Main Street looking north from Douglas Avenue. Smith's Restaurant is on the left side. 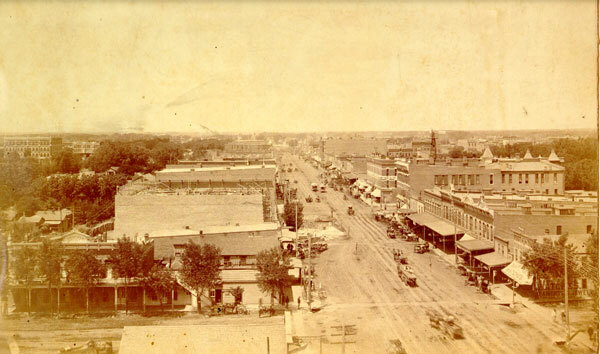 The Wichita Wholesale Grocer Company is on the left side in far back. 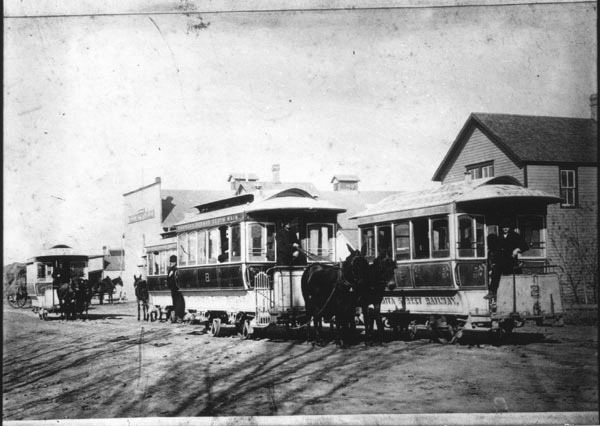 Keywords: Street scenes, commercial buildings, horses, buggy, streetcar. Description: North side of the 100 block of East Douglas. 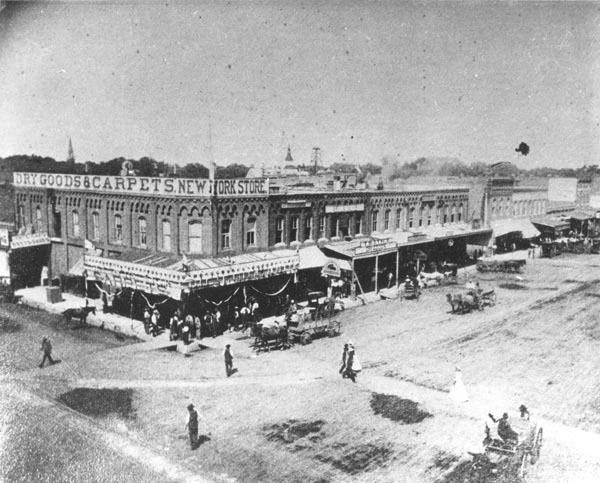 The New York Store is located at 100 East Douglas, and is a dry goods and carpet store. 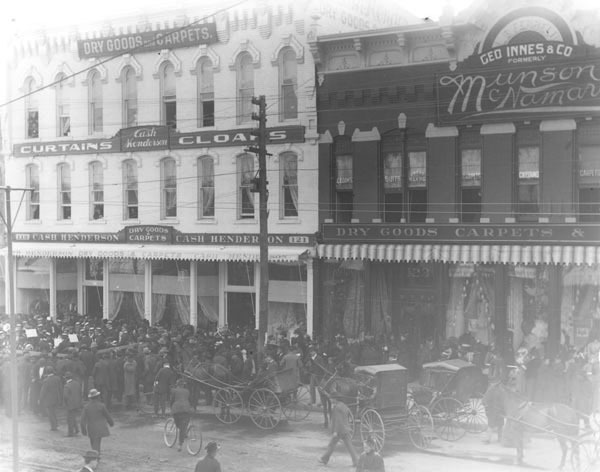 T. H. Lynch Dry Goods is located at 104 East Douglas. Many of the buildings on this block contain real estate offices due to the land boom. Keywords: Street scenes, business and industry, commercial buildings, horses, wagons. 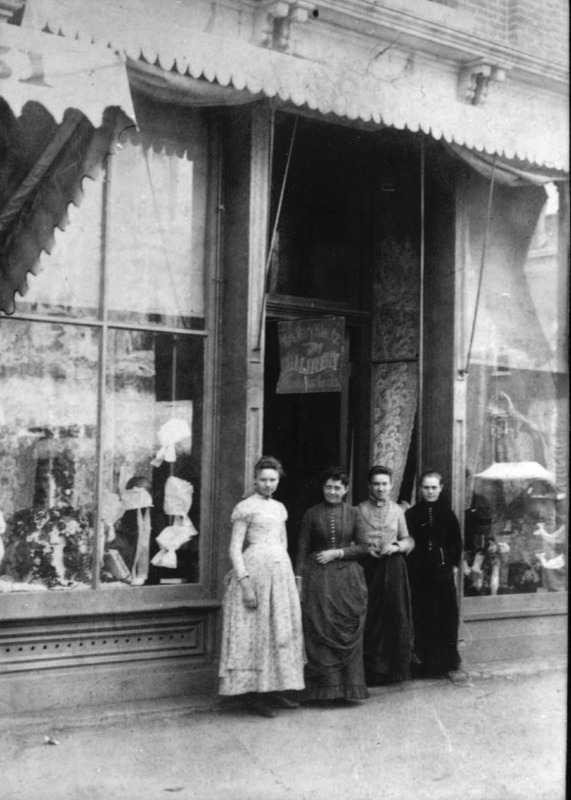 Description: Exterior view of millinery shop owned by Mrs. Mary E. Klentz at 153 North Main Street. The woman second from left may be Mrs. Klentz. Keywords: Wichita, business and industry, people, street scenes, hats, fashion, women, storefronts. Description: 100 block North Market looking south from the west side. The Smith & Skinner Block and the Walter & Snively Blocks are shown. J. R. Snively Real Estate and Garfield University offices are located in these buildings. Keywords: Street scenes, commercial buildings, horses, buggy. 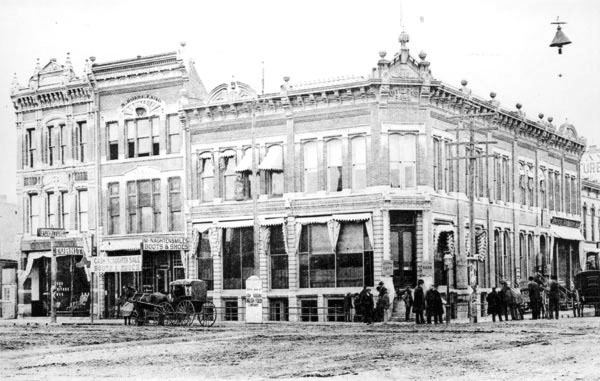 Description: Northwest corner of Main and Douglas showing the Citizens Bank corner. 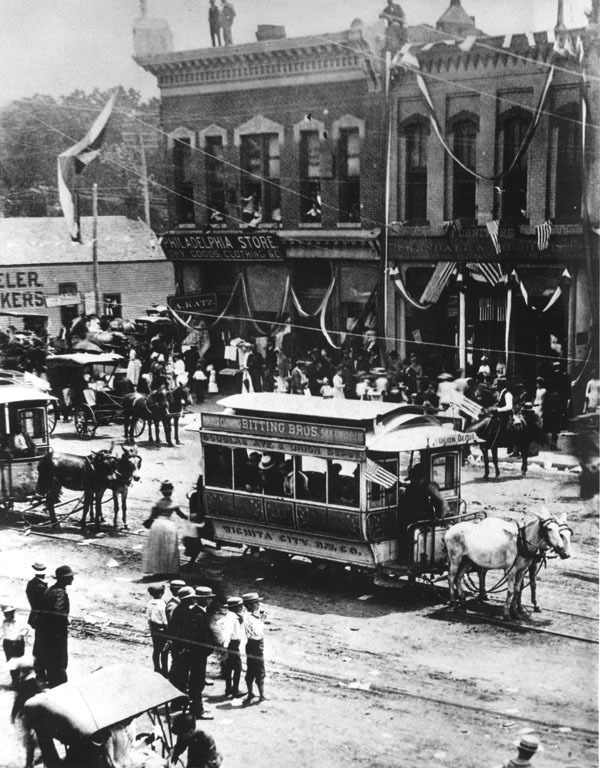 Keywords: Street scenes, people, horses, buggy, commercial buildings. Description: Cash Henderson's Dry Goods and George Innes & Company, formerly Munson and McNamara's. 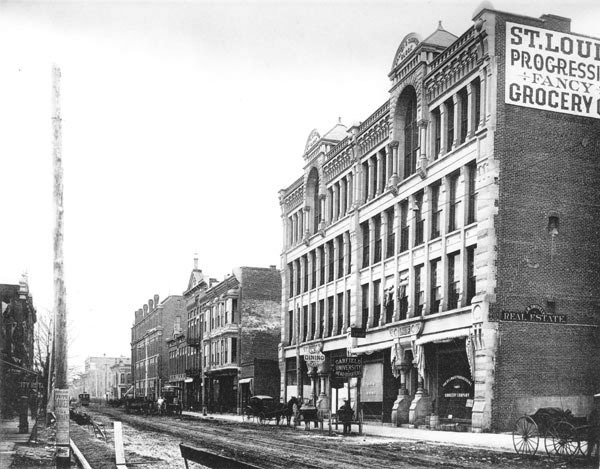 These dry goods stores were located in the 100 block of North Main on the west side. 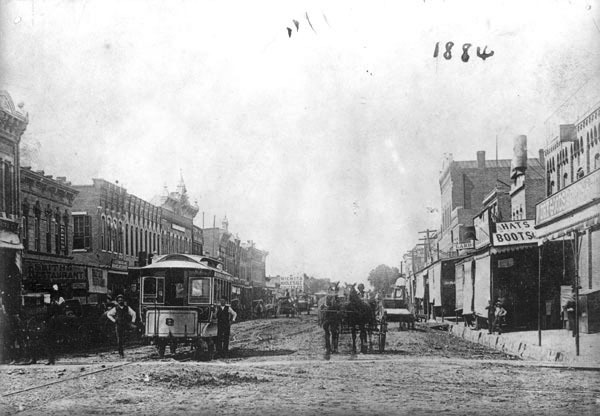 Keywords: Business and industry, street scenes, horse, buggy.